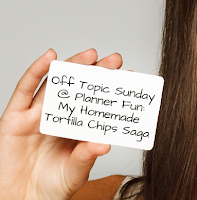 Off Topic Sunday is a new feature at Planner Fun and something I've thought about doing for awhile. I used to have 2 or 3 blogs going at one time because I felt like I had to compartmentalize all my interests. While Planner Fun is a very specific topic, having an off-topic day allows me to write about some of my other interests. One of the reasons I follow a plant-based diet is because it helps me to lose weight As a matter of fact, it's about the only way I can lose weight since my transplant (Prednisone and other medications are the culprit). Tortilla chips are a staple since they are low in calories and great for snacking - but getting just the right crispiness has been quite the dilemma. I have tried these chips every which way there is: cut in triangles, spritzed with water, baked, flipped and baked some more...none have delivered an acceptable chip. After all that work, I just knew there had to be an easier way and I spent a lot of time searching blogs, Facebook groups and websites until I found a solution from a member of one of my Facebook groups. This guy takes whole corn tortillas and puts them directly on his oven rack, and this is much easier than all the ways I've tried. After baking them, he carefully breaks them in half - twice: four chips per tortilla. After trial and error, I found that Mission Yellow Corn Tortillas work the best for me. I preheat my oven to 375 degrees and bake them for 7 minutes. My husband likes them at 4 minutes and my oldest likes them almost hard at 8 minutes - I just take them out at different times which isn't difficult at all. Obviously, you would have to work out your own cooking times with trial and error since all ovens are not created equal! Last week a batch of them bubbled up while baking and made them difficult to break up without making a mess. For the next batch, I cut the tortillas in half before baking and didn't have that problem - it also made breaking them in half easier and neater. My family likes eating our chips in soups and chili as well as dipping them in salsa, homemade hummus and guacamole. Any questions about chips or plant-based eating? Feel free to ask questions in the comments.